As we look down the road to the next few months in the remainder of the Grange year, we have many happenings on the horizon. Many Granges will be holding their annual fairs; this is an excellent time to promote your Grange. One of the requirements for Honor Grange is an Open House or event to promote your Grange, what a better use of a member’s time than to be available to answer questions and hand out material about your Grange. Brothers and Sisters, we must be continually selling our Grange and its potential to the public in order to grow. We need to optimize these opportunities we have with the public and sell, sell, sell. There are many ways for us to sell our Grange and not be “pushy”, one Grange has place mats with the Granges activities on them at each place setting during dinners, all at almost NO cost, they do them on a computer and print them on 8.5” x 14” paper, and some Granges have applications on every table during public dinners. We can grow our Grange; all we need is the desire to make it happen. By the time you read this article, the joint picnic with RI State Grange will have passed, RI hosted, and we thank them, they had over 100 members in attendance, congrats to them. We had a wonderful day of food, fun and festivities, if we do this again, you really do not want to miss it. Fast approaching is the Big E which runs from Sept 16 – Oct 2, 2011. Your help is always needed in the NE Grange Building. Contact Betty Jane Gardiner or Dawn Percoski if you can help. We congratulate Dawn Percoski on accepting the position of Grange Experience Director. I know Lisa Lamoureux is planning a day for all juniors and youth to help in the NE Grange Building, look for details, this is a GREAT way for our younger members to support the Grange. We will again be hosting the CT Room during the entire 17 days of the fair and will be making a BIG showing on Grange Day. Contact me if you want to participate on Grange Day. Our State Grange Social Connection has a Competitive Night planned on September 17th, at Prospect Grange, this sounds like another home run idea from these ladies, you do not want to miss this one. Come enjoy a potluck dinner and then the competition. 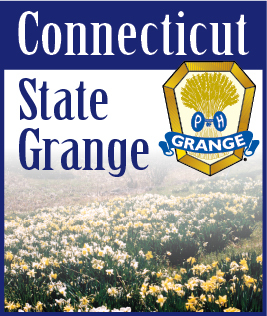 All Granges should be looking down the road to our upcoming State Session October 20 – 22, 2011 at the Plaza Hartford Hotel in East Hartford (formerly the Sheraton). Our annual session completes our work for the year and charts our course for the future. There will be much, much more on the Annual Session come soon. Only we can ensure these and many other events are successful, our Granges work hard to meet the needs of their members and community, so let’s support them and make this summer’s events one for the record books.